We are please to announce that we are offering two scholarships to attendees who would like to attend but would otherwise financially be unable to. This was in part due to a pay it forward program that Jack from TSP mentioned in a podcast. There is a link to the podcast on the MSE site. 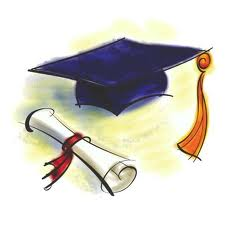 For people who have the means of setting up a scholarship it has typically been to attend a university. Well lately a degree from a typical university hasn’t gotten you ahead financially like the school recruiters told you it would. Most people just rack up the debt, and end up taking jobs that have nothing to do with their degree or even need a degree for the position. We want to help a few people out where we could. Here are all the details. Tonight – Wednesday November 6th at 7pm Edible Wild Plants presented by Chris Martini, park manager of Southeastway Park, presenting at the Franklin Township Civic League, 8822 Southeastern Avenue Indianapolis, IN. This is a free class and a great opportunity to learn about wild edibles. This is definitely something you don’t want to learn from a book or online. If you want to register online please do so at the Alternative Gardening Meetup site. Saturday November 23rh 9am. Full day class on homesteading. I will be presenting on turning your back yard into a food production machine, then how to preserve and store what you have produced. Lastly some DIY items you can make yourself, healthier and cheaper such as; laundry soap, toothpaste and more. Get free samples and register to win a free planting barrel. A $120 value. The cost is $40 per person and a discount for couples. Pay in advance to reserve your seat. More details and to register here. Global Soaps will be on hand to sell and discuss natural soap and lotion making. The class is full with Trade School Indy. This is a short, but dense class on turning your back yard into a food production machine. Get some ideas and get ready for spring. If you would like a similar class at your location Contact Us. Or if you want the Be Prepared Series. There is a full day class, with bonus of making your own soaps, laundry soap and other topics including food preservation. Free samples of tooth paste and soaps. If you want laundry soap sample please bring a sealable 1 cup container for each soap type (currently 3). We will have sample containers for the toothpastes. Register through the link below. Not 100% confirmed yet but we may have a local soap and lotion producer present who have goat milk soaps and lotions. Learn about the process, try, and buy products. I have personally been to their operation and was very impressed. More details once everything is confirmed and links to their site. Global Soaps will be at the class to discuss and sell natural soaps and lotions. If there are some other local producers (that align with the topics covered) in the area let me know, we may have additional spaces available for booth or tables. Call out to local landscapers! I am looking to work with local landscaping companies in and around central Indiana to fill a unique niche integrating permaculture into current landscapes and future landscape projects to be both productive and retaining visual appeal. Contact me for details. Homesteading – How did we get here? Today I hosted some good folks from the communist state of Illinois. I gave them the outdoor tour and talked about what we have done and where we are going. How we got where we are today and lessons learned along the way. They made the comment we are just getting started and wanting to learn more. I remember being there several years ago. It made me think to when we got started to where we are today. Many people look at what we are doing on our 0.2 acre suburbia homestead and think we are so far ahead of the game. I see it as the opposite. I see how much more I have to do. I look back when we bought this place and think how it has evolved, how we have evolved. The one common denominator was it didn’t happen overnight. I wasn’t always homestead minded. I once was one of the sheeple following the next person in line. Buying, consuming, and spending. I got hooked from listening to The Survival Podcast. It isn’t the doom and gloom, doomsday prepper, and militia. It is a lot of common sense, and I have learned quite a bit just from having it on in the background. The bushels of pears and apples ripening on the trees didn’t just come with the property. We planted them. One tree at a time. We used to buy in spring when everyone had them in the box stores or the 1 year old seedling from the catalogs. Now we trade, start our own, grafts, and buy on clearance or end of season at 50% off or better. We learned there was a better more cost effective way. We learned the hard way and bought full price trees before we learned there is a better way. We make our own laundry soap. We just recently started this. $0.02/load vs. $1.00 load does add up. It was a learning process. 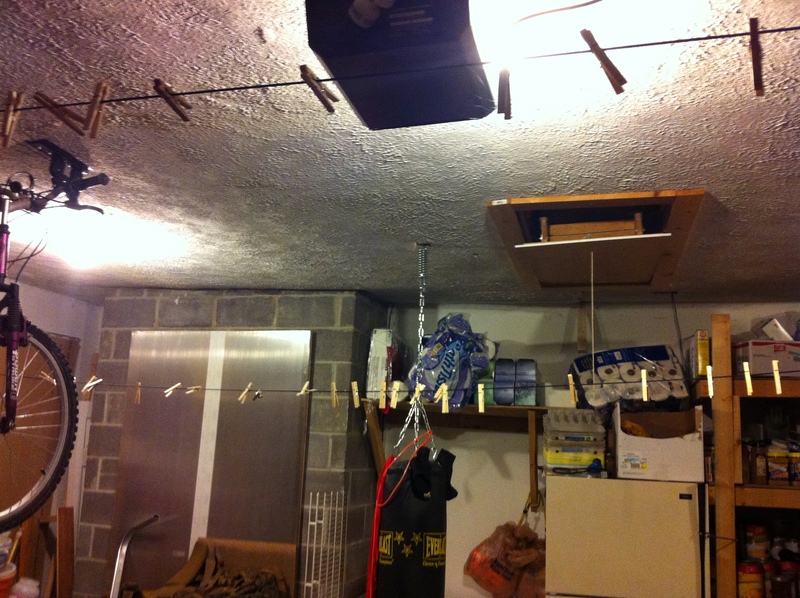 Rather than use the dryer we are line drying our clothes. This alone cut our eclectic bill in ½ . From March-November I know we will not use it, and if all goes well will not use it again. 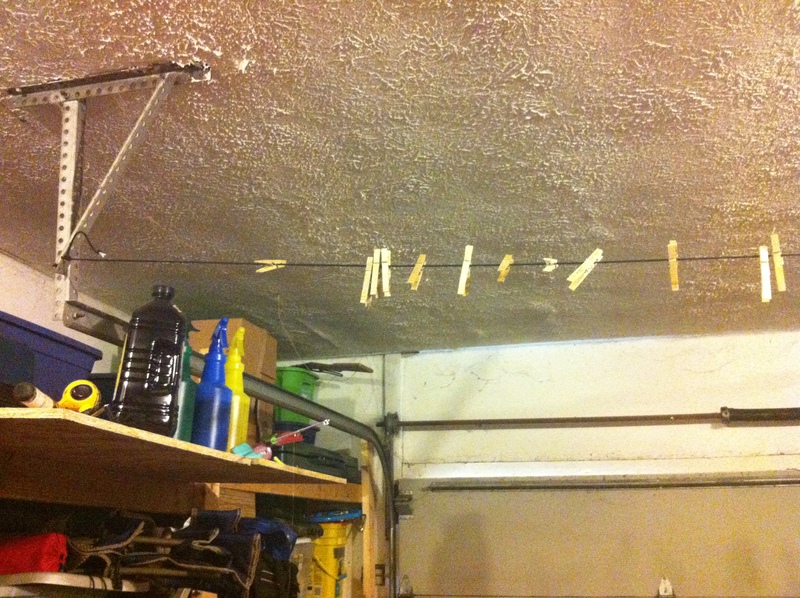 “So what do you do when it is raining or snowing, or freezing outside?” Either don’t do laundry or hang in our garage. We don’t park in our garage. It is for storage, workout area, and a play area for the kids when it is raining outside. For the cost of a few feet of paracord I have two lines in my garage. Here is a picture in our garage. 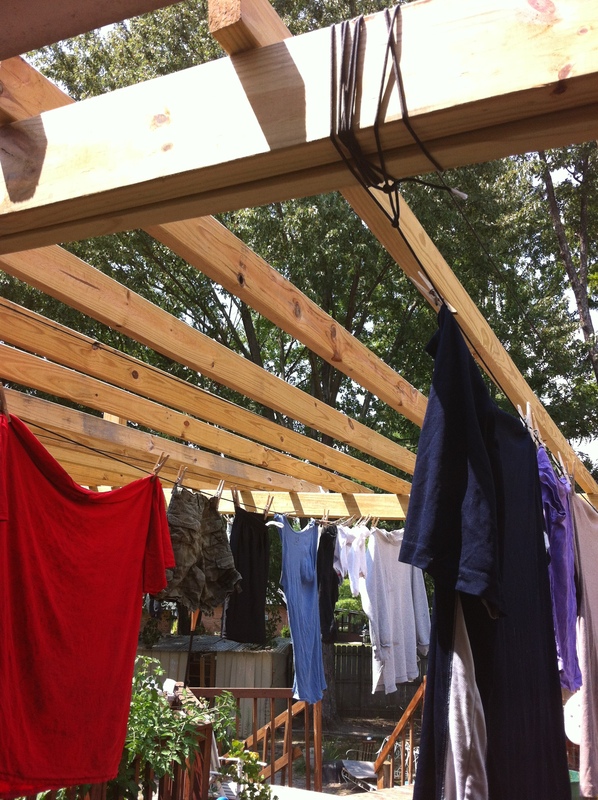 Here is one where I turned the pergola into a clothesline. The strawberry groundcover didn’t happen overnight. It took time and planting. Now we get to enjoy fresh strawberries, chemical free, organically grown, and well free year after year. You can start at any time, and start small. You do not have to do everything at once. When it came to canning I started with one package of jars, one pot, and tome tomatoes out of my garden. I now have 500+ jars accumulated from family, craigslist, and goodwill. My next step is to get the reusable lids. We have boxes of dehydrated foods from our garden and grocery deals. It didn’t happen overnight. We found our dehydrator in a family members storage unit. Started with a few herbs, after gaining success and learning the skill, we now will dehydrate shrimp, eggs, and make jerky. I remember when I first started learning about homesteading and preparedness I was overwhelmed by all that I thought I needed to do overnight. I had lists, schedule, priority of items. What I once thought was the top most important item has since fallen to low or no importance. There is no golden book or plan to follow. Waking up and becoming more aware is the best tip I can give. Your bran, the knowledge you learn, the experiences is what is key. I have made many failures for any success. I never consider them failures, but more a lesson on what not to do the next time, or how could I have made it better. Start small, but start today. Challenge yourself to learn something new each week, or a goal each month for prepare and grow your homestead. It could be planting a fruit tree, or reading a book on canning, or try a new more sustainable food on your next trip to the grocery. We tried goat and were pleasantly surprised. When I look back we have come a long way, and I have learned so much more than I did 5 years ago. I learn something new almost each day. For instance I have 24 more hours of new permaculture videos Geoff Lawton just posted as part of my class. If you feel overwhelmed, don’t. You eat an elephant one bite at a time. Get your own homestead in order by one thing at a time. What helped and scared me was when I made lists of all I wanted to do and get accomplish. Some are low hanging fruit, and easily completed. But seeing it all there on a list made it more manageable and easier to grasp. 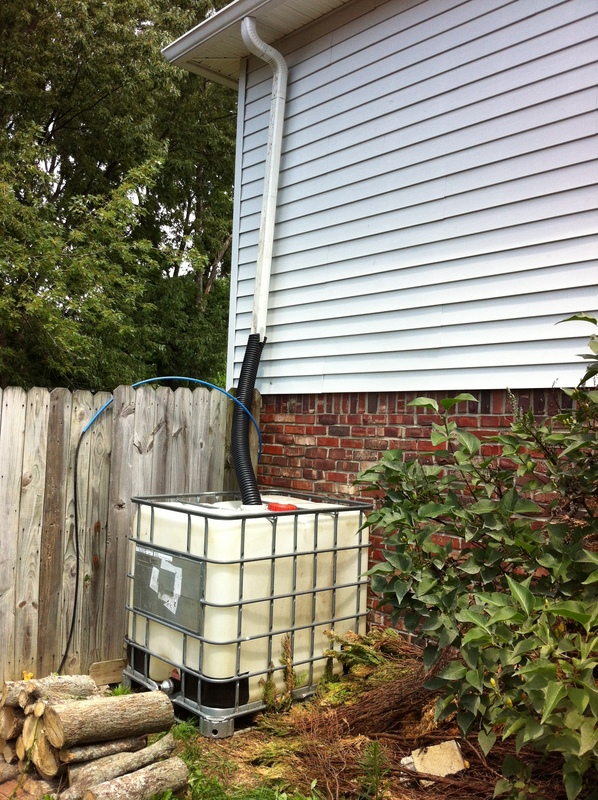 Putting in out poly tote rainbarrel seemed overwhelming, and I kept putting it off. It took less than 30 min. One more thing to check off my list. What can you cross off your list today? This week? This month? Here is a class to make your hard earned money stretch further. All the tips, techniques, and practices my family and I actually use. Demos will be available, handouts will be made available of the items we cover, the products, places to purchase, and recipes. This should be about 2 hours long. If you have missed out on the farm tours, you could hang out after, but it will not be the full 2 hour tours others have gotten, feel free to ask questions before, or after class. We will be sitting outside on our deck, and have bench seating and a picnic table. There is also room for folding chairs if you bring your own. Space is limited so it will be the first 25. There will also be home made pizza as an appetizer to demonstrate cost cutting. There is no public restroom available. Sorry. Cost is $10 per person or $15/couple, easily made up if you use the tips and techniques demonstrated. We have saved well over $700/year doing these activities. Fee free to park in the driveway, our cares will be parked elsewhere. Bonus, drawing at end of class. Many people believe local means the local Wal-Mart or local big box grocery store. Eating and shopping local means shopping from items PRODUCED in your local community. Here are some reasons you should shop and eat local. Once the farms a gone you are a slave to corporate America. If we do not support our local farmers and food producers you will be at the mercy of whatever the big groceries and big companies throw at you. No diversity, no heirloom vegetables, no unique species. You get the same mass produced tomatoes, chicken and they can pump and spray whatever they want on it. You are held to the ONLY thing on the market. Without local support these local food producers cannot continue and you will be left with only a few options. Know where your food comes from. NO, your groceries do not come from Wal-Mart, or Kroger. They are more than likely shipped from across the country and sometimes the world. Know the farmer who produces your veggies, your meat. Be able to see how it is made, taste the difference. Know that within 30 miles you can have all kinds of products, fresh, not shipped, not frozen, not sprayed to preserve the freshness, not harvested weeks before they it is ready. Not in feed lots fed all kinds of hormones, antibiotics, and GMO grains saturated in chemicals. Know how your food was raised. Have you ever wanted to know how your protein source was treated while it was growing? Wanted to know what kinds of pesticides, herbicides were used? Want to know more about your food? Ask. Go to a farmers market and ask the source. A good friend and local farmer can tell me what pastures they grazed in, if any of the stock were sick, he even posts pictures of the cows and pigs out in the pasture. Some farmers let you tour their farms and really see how things are done. Why would you ban cameras on farms if you had nothing to hide? How far did your food have to travel? Was it down the road or across the world. With gas prices rising, food costs will increase. Local farmers drive an average of less than 50 miles to get to market. Sometimes the produce is picked that same day as you get it. How long ago did a head of lettuce from Venezuela have to be picked to get from the farm, to the sorting area, to the transportation area, through customs, into another warehouse, then to the store? My eggs latterly travel 30 feet from our coop to our kitchen. If you have never had farm fresh eggs, you are missing out. SO much better than the crap they put on the shelves at the store. I will NEVER buy a dozen white eggs from big box stores again. There is just no comparison. Sometimes they can be up to 6 month old before you get them. Mine may be 6 hours. Less money going to the government. The further away your food travels the more money you supply the clowns in the clown house (our governments). Think of the property tax on the land, the gas to harvest on the mega farms, the tax on shipping it here, the tax on customs, the tax on imports, the tax on warehousing, the tax on the utilities on warehousing, the tax on transportation to the store, the tax on the store location, the taxes for the utilities on the store, the taxes to the employees in the transportation activities, the taxes on the employees on the farm, the taxes on the employees in the warehouse and I am sure I am missing some. Yes all of this creates jobs, but it also drive up your costs. For a local farmer, things are much simpler. His land, his utilities, and his gas to get it to you. So why is buying local more expensive? There are no government subsidies, and it is the true cost of food. All the taxes from buying at the big box stores goes to supplement the mega farms. But the difference is, the clowns in the clown house get their cut too. Flavor and freshness. Picked the same day or fresh to your door. You cannot compare the difference from big box food to local sourced. No additives, preservatives, flavor enhancers. Real food, and real simple. If you cannot raise your own food, support the local farmers, artesian food crafts. I have not always been of this opinion. It wasn’t until I started going regularly to the farmers markets and meeting my local food producers. I learned how proud they are of their products and they should be. I through parmesan cheese came out of the green tube shaker at the store. I met a man from Italy, who crafted parmesan cheese and the flavor was simply amazing. Eating fresh eggs from my back yard. Being able to walk out my back door and pick anything and eat right off the bush. No washing needed, no worries. My kids can walk out and know they can eat anything in the garden without worries, and they actually fight over the fruits and veggies. Why? Because they are packed FULL of flavor. They have not been picked weeks earlier and then sat on a store shelf. Last year I bought a ½ side of beef for around $750. We got steaks, ribs, roasts, hamburger, and even got organ meat as a treat for our dog. It averaged around $2 a lb. You cannot even get the cheap burger for that now. Steaks are around $13 a lb. We have been eating on this meat for almost a year and still going. I know the farmer, I know his practices, he talked me through how he raised his cows. Another local farmer invited me out to his farm to see how he raises his pigs, cows and chickens. I know my family is not getting chemical laden meats, and there is nothing “hidden” from the process. My wife met the butcher, as it was an older husband and wife who had been butchering all their lives. She got to custom cut, and process all our meat. Every time I speak to a local food producer I learn something new. My wife tells me I have what she calls “the gift of gab” aka I can talk to anyone about anything. This is also why she always plans to spend hours at the market even though we only want a few things. I learn about new herbs, that not all grass is the same for livestock, I learn that what one market is out of, another has a surplus. I learn who has the best berries, who makes an amazing sour dough bread. I learn that after speaking to the artisan bread maker, he invited me back to their bakery to see how it is all made, and offered up a sourdough starter for free. I learn about raw milk, the benefits, the benefits of lacto fermenting foods, and that you can go get you kitchen knives professionally sharpened. If you have never been to a farmers market, go check one out. They are an amazing place to learn. Remember the vendors are there to sell a product. But they are usually more than happy to tell you all you want to know about your purchase or potential purchase. Bring cash, but some do take cards. They must also either pass on the fees of accepting cards or eat the fees. Cash is always easier and better. Markets are usually on the weekends, some are held during the week. Quick post. Indiana area Home Depot stores have blueberry, raspberry, grape vines and select fruit trees 50% off. Wall mart also has 50% off fruit trees. With a little care and watching them in the summer heat you am plant now and save or leave them in buckets and plant in fall. Be sure to keep them watered.